Science Fiction has undoubtedly captivated our minds and imaginations for many centuries. Sci-fi films over the years have depicted all sorts of crazy technological innovations that are now considered plausible and accepted. Last year, the White House decided to celebrate the cinematic significance of science fiction and the ‘Back to the Future’ film in particular, by inviting artists, writers, scientists and engineers to share their ideas for using science fiction as a source of inspiration. The reason behind this effort is that a lot of the innovations we take for granted today, such as mobile phones, flat panel displays, self-driving cars, hoverboads and gesture based computing have been inspired by science fiction films like the Back to the Future trilogy, Minority Report, 2001 and others. The scene in Minority Report where Tom Cruise’s character interacts with a computer in an ‘orchestra-conductor’ fashion using gestures is instilled to our memories. And such similar examples are numerous. So how does science fiction mix with design? And what happens when science fiction open itself to design thinking? Design Fiction is making things that tell stories. Like science fiction, these stories bring into focus certain matters-of-concern, such as how life is lived, questioning how technology is used and its implications, speculating about the course of events; all of the unique abilities of science-fiction to incite imagination-filling conversations about alternative futures.Like science fiction, design fiction creates imaginative conversations about possible future worlds. Design fiction is a mix of design, science fact and science fiction. It is an amalgamation of practices that together bend the expectations as to what each does on its own and ties them together into something new. Design fiction is the cousin of science fiction. It is concerned more about exploring multiple potential futures rather than filling out the world with ‘uninspired sameness’. Design Fiction as a method for design research asks “how the world could be”, instead of discussing how the world is. “Design fiction” can be interpreted as a new strategy for design research, trying by systematically question and deconstruct the self-evident, transcending it towards new, possible futures; concretely materializing, visualizing and embodying relevant controversies and perspectives in the form of artifacts, interfaces, installations and performances. One of the first examples of Design Fiction is BT’s vision of future communication with creating a video that envisages how we would remotely communicate in the future. In 2001: A Space Odyssey, there is a clip that shows two film characters holding a device that looks very similar to an iPad (in fact so similar that it showed up in lawsuits between Samsung and Apple). Perhaps the most popular example of Design Fiction (at least from a corporate point of view) is Microsoft’s Future Productivity Vision. Back in 2009, Microsoft created a video to show how technology could transform education at school and in the home in the near future (5-10 years from then). Even though this is by far the most popular example of Design Fiction, it still nevertheless manages to only show a overly perfected version of the future where the Wi-Fi always works, devices are always charged and everyone is happy and smiley and super productive. For example, the BT video shows a much greater degree of realism and normalcy- showing the business man trying to work from home through video conference while his daughter is disturbing him and asking him to play with her. I become intrigued by Design Fiction when I read Julian Bleecker’s short essay on design fiction and since then I have been actively looking for good examples of Design Fiction by designers/design researchers. Below I will describe three recent efforts in Design Fiction that will inspire you to consider this speculative method in your next piece of design research work. Winning Formula, is project by Near Future Laboratory which takes the form of a newspaper sports section from the near future, explores these questions and some of the more unreal features of data-driven football future highlighting implications below the surface such as data manipulation as a kind of doping, the impacts of high-frequency sport betting, or politics related to data-based services like media, measurement and reporting. Protopolicy is a project that uses design fiction to respond to the ‘Ageing in Place’ policy agenda by co-creating future design fictions that envisage what a future of ‘flexible living’ – a third space that has the benefits of independent living without the downsides of loneliness, fear and vulnerability – might look like. The idea is that these design fictions would then be shared with politicians in a ‘design fiction provocation’ event to be held in Westminster in order to help negotiate political questions. type’, ‘User Guide’ and mini film. The design team also created a job description for the Smart Object Therapist, intervention report and mini film. The design fictions were shared with civil servants and MPs at an event hosted in Westminster by All-Party Parliamentary Design and Innovation Group (APDIG) as well as through telephone interviews. 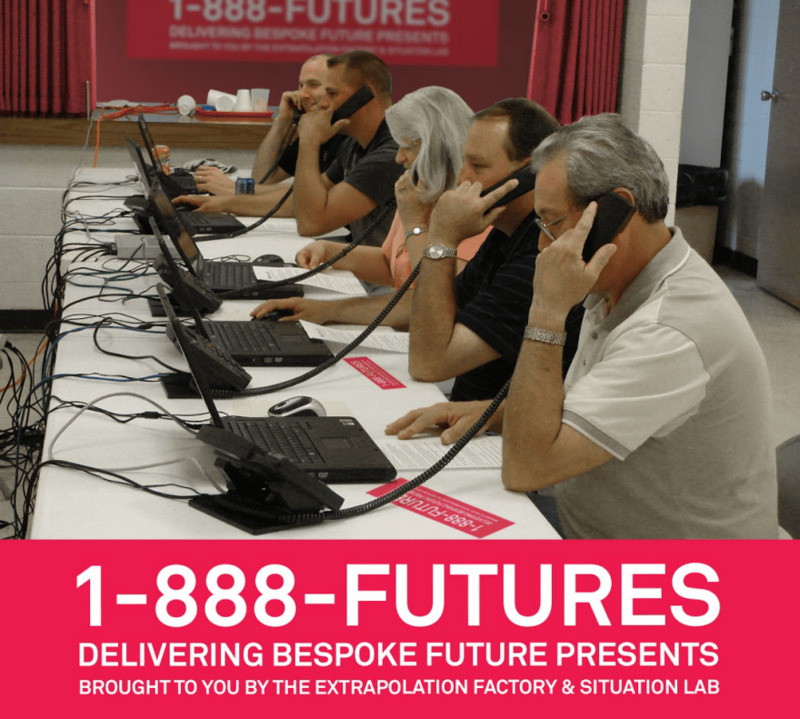 Another great example of design fiction, is the 1-888-futures telephone based service by the SituationLab and Extrapolation Factory which allows anyone in the US to request a gift from the future, created to order and shipped to their chosen recipient. The service is a playful research project that capitalises on collective creativity and experimenting with new techniques for crowdsourcing visions of future scenarios. These recent examples of Design Fiction provide very inspiring examples of creative applications of speculative design. Design Fiction as a method provides the means to contribute to creating desirable futures and establishing new possibilities from a design perspective.